Early Sunday morning I completed my second 100-mile endurance run. The Vermont 100 took me almost exactly one hour longer this year than last year but to say I am disappointed would be a lie. I am ecstatic with my time given the high temps and humidity and other environmental conditions, and the lessons learned were numerous. I can not wait for my next 100 to build on this experience. The results have been posted on the Vermont 100 website. Please note that the 100K results are include so you'll have to ignore any runners with bib numbers in the 400s. I do not know my overall placement but my overall time was 21 hours and 8 minutes. While I plan on writing a more extensive race report in the next few days (no, it won't take three months like last time, and I do promise brevity), I want to give a shout out to a few key people from the weekend. First, thank you to my wife, Kelly, and kids, Quinn and Riley, for all their help. Kelly was instrumental in pulling everyone's tent site back together after the storm hit us Saturday afternoon (our tent had a tree laying across it). Next, thanks to Brian for his excellent pacing and to his family for their support. Next, thanks to Pops and Boo Boo for helping with the kids and for their excellent crewing, all day and all night. Lastly, thanks goes to Frank (google "Rawfood Frank"), with whom I ran almost half the race and learned tons of great nutritional stuff, and my great buddy Jamie with whom I ran about 71 miles. Thanks for all the help. This race would have not been nearly as fun without one of you. Two days away from my second Vermont 100 I am not sure what to feel. I am excited that it is finally here but at the same time I am harboring some inexplicable dread. Maybe it is because I am not a fan of repeating courses, especially long distance ones, or perhaps it is because the weather report is calling for temps in the high 80s with high humidity. Or maybe it is because I don't feel like my training is where it should be. I have a feeling that I am not the only one with this concern. Here are some interesting tidbits I concocted to ease my concerns. From Jan 1 to the final week before the VT 100, I covered 1,114 miles on my training runs in 2007 while during the same period this year I ran 1,120 miles for a variance half a percent. Pretty damn close, and keep in mind I do not use a training plan so this is purely by coincidence. Add in all the biking I have been doing this year and then this year's training doesn't seem all that bad. Also, last year my pace fell off precipitously between miles 70-84 because of my stomach issues. If I run the same race this year as I did last year and avoid the stomach issues for those 14 miles and maintain my normal pace, I can shave off 35 minutes (!) from last year's time to put me at 19:52. I know this is crazy analytics but it helps mentally to think about these things. Anyway, the race is here and I am going to run it. And it is going to be hot. Those there are the facts. I'll let you know what transpires in my post next week, or you can keep track of my results by visiting the Vermont 100 website. Alright, it's been awhile since I have posted on my training. So let's catch up. My training has taken a beating the last few weeks. The week of June 16th found me playing the part of single dad as Kelly was on a business trip to Florida. That only left the weekend after her return for serious training. However, Saturday was the Mount Washington Road Race (which I ran) and which subsequently left me with a pretty nasty cold. So Sunday I was feeling terrible and missed a planned long run with L.L.Bean buddy Jim. Sunday night I was dealing with not only my cold but a vomiting son who always shares his viruses with me. Worst case nightmares were visiting my thoughts and I was quite depressed about the prospect of missing out on helping Jamie at his Western States 100 attempt. The rest of the week, before flying off to the eventually cancelled Western States 100, was all about washing my hands and ridding myself of the cold I was carrying. Then I went to California, missed my long training run that was to be my pacing for Jamie, got a few decent runs in, and came home. You know this well if you read my verbose account in my previous blog post. So what has happened since returning from California. First, I did catch the stomach virus Quinn introduced to the our home. Riley had it when she picked me up at the airport, and I am assuming passed it on to me through all the hugging we did. The stomach virus hit me the day before the L.L.Bean 4th of July 10K while performing my race committee duty. That happened in the morning and the entire afternoon was spent in bed at home. The next morning, 4th of July, was race day and I arose at 3:45 to get to Freeport to start my race committee duty of the day at 4:30. My job was to set up the race course, including mile markers, laying out cones for all the volunteer zones, and setting up the water stops. By 6:30 I was back to the start line and runners were already appearing around the start area. With only an hour to go to race time, my stomach was still really unsettled and I was unsure about racing. I love this race and spent a lot of volunteer time to get it set up, so I decided that I would run and if necessary bail out. But I at least wanted to give it a shot. At start time the temps were perfect and the record sized field was ready to run. The race itself went off well for me, and I hit the first mile in 5:40 and felt really good doing it. At this point, I settled in with a group of guys who I have raced with in the past and paced myself on them. I stayed with this group until the end and clocked in a time of 38:17, 3 seconds better than last year. Considering my early wake time, race set up duties, and ill stomach, not too shabby. Kelly and my father-in-law Phil also ran and did so well (my measure of success is the size of smile immediately upon finishing). Also racing was Riley! She ran the 1-mile fun run and did a great job. Kelly ran with her, and other than a small section at the turn around where Riley demanded that Kelly carry her, Riley ran the entire way and finished with a bigger smile than Kelly, Phil, and me combined! The day after the 10K race I headed over to Pineland for a final long run before my shortened taper for the Vermont 100 began. I started at 5 AM and ran the first couple hours solo. While I am a big fan of running long with others, I do enjoy the early morning solitude of Pineland. As it is in many places, Pineland is absolutely magical in those couple hours following sunrise. As the sun ascends and the day heats up, out come the deer flies and then everything changes. After a couple hours of running I joined a much larger group that included Jamie, Ian and Emma, James, Jim, and Lilly. Despite some lingering stomach issues and extreme moodiness (due to feelings of lack of preparedness for the quickly upcoming Vermont 100), I finished the day with just shy of 29 miles in 4:32 hours. I felt okay and went on with Kelly and the kids to a post-run, pity party James threw for Jamie's experience at the cancelled Western States 100. On to last week. I had a good past week. Physically I felt okay with no stomach or cold viruses present. I got some pretty good miles in, probably a little more than typically suggested for taper, but mentally I needed it. I got a few days of cycling into work (total of about 80 miles on the bike this week) and got in one run to work. It was a hot week and I think I chose the hottest, most humid day to run to work. Wednesday morning I set out for the just short of 15 mile run to work and within minutes the deer flies found me. After a mile of battling these annoylingly painful biters, I considered turning around and going home. The problem (designed to ensure I run to work) was that I had no car to drive to work (left at work for the drive home) and it was about too late to get home and bike to work. So I continued on. At the end of the run I was soaked from perspiration and I had been rationing my water bottle for about 45 minutes. The end result was that the run took 15 minutes longer than any of my past runs to work and must have consumed nearly half of my body's hydration! This was one run I will happily forget. Today and yesterday I got in runs around Pineland. Yesterday I met Brian (my 100-mile pacer), Jamie, and Lilly at 7 AM and we ran for a couple hours (estimated because I thought I had lost my GPS Saturday morning and ran without it only to return home to discover Kelly found it in exactly the spot I had been searching). After about 1:30 Brian took his leave and then Jamie signed off about 15 minutes later. Lilly and I continued on as we both swatted flies from each other's back and had a great conversation. Lilly is somewhat new to our group and wicked smart. She's a physics professor at Bates College and apparently knows as much about biting insects (very frightening amount of knowledge) as she does about E=MC2. I also ran into a buddy from work, Brian O. , who lives near Pineland and often runs there (but whom I have never run into there). Funny enough that the first time I ever met Brian out there I happened to be running with Lilly (professor at Bates) and Brian's wife will start teaching at Bates in the Fall. How about that coincidence. And lastly was my run with Kelly this morning at Pineland. Today was her birthday and the kids had a sleepover with the grandparents at camp, so we were free to sleep in and run together (just like all our single and kid-free friends). We had a great run around the farm side of Pineland and Kelly got in the 1:45 run her training schedule demanded. The deer flies also joined us but were a little better than Saturday. Kelly did admirably well having not run the undulating trails fo Pineland really at all. She is setting herself up well to set a PR at the Nike Women's Marathon in San Francisco in October. By the way, she is fundraising for the Leukemia & Lymphoma Society in honor of her grandmother (who lost a battle to leukemia last year) and for me and my 5th anniversary of being cancer free. Give if you've got...I'll post the link to her fundraising page soon. One last thing. Kelly and I were out and about in Portland afternoon taking advantage of the kids spending the night away and we stumbled onto a new "bier cafe" in Portland. The place is super cool so if you are ever find yourself walking around Portland or sitting at home in need of a very unique beer experience, check out Novare Res. I feel a mandatory Vermont 100 celebration party happening here! Five minutes after landing in San Jose the Wednesday before the Western States 100, I learned the race was cancelled. My first reaction was sorrow for Jamie and all the preparation he had put into the race. My second reaction was an emphatic "What?!?!?!". This was the first time this race has been cancelled in its 35 years, and it happened the year I was to participate, albeit as a pacer and not a racer. I am starting to get a complex: first, I missed out on the WS100 lottery, the Massanutten Mountain Trails 100 filled up in record time and I was an hour later in signing up, and I missed out on the Mount Washington Road Race lottery (I did get in via the Maine Track Club). And now God decided to scour the dry northern California landscape with lightning strikes resulting in approximately 800-1000 wildfires during my trip out there. After driving a couple hours we stopped off at Sonora for a short night's sleep. Sonora's an old sleepy ghost town with a lot of charm, but not enough to keep us there for long. Early Thursday morning we headed out. I say "early" with a bit of snicker because it was much earlier than I thought. When I rolled out of bed I was sure the alarm clock read 8:30 AM. While I haven't slept until 8:30 for probably 3 1/2 years, I wrote the late time off to my travel the day before and the late hour we got to bed. It wasn't until we checked out, finished breakfast and left town did I realize I had misread the clock by two hours. 6:30 AM wake up is more my style. Danny took a great scenic route up to Tahoe that took us through Calaveras County, made famous by Mark Twain's story "The Celebrated Jumping Frog of Calaveras County". Probably only a literature nerd and English minor like would notice this, but still cool. After entering I-80 near Auburn (the WS 100 finish) and driving north for roughly the entire length of the WS 100 course (this interstate parallels the course), the reason for the race cancellation became painfully obvious. The visibility on the road was horrendous and the aroma was reminiscent of a campfire. Not good running air. So kudos goes to the race directors for having the courage to do what was right. We rolled into Squaw Valley after noon and quickly found Jamie and his brother, Chris. We all decided to forgo lunch for a "quick" 4 1/2 mile run up the first hill of the race to Emigrant Pass, what I think is the highest point on the race course. 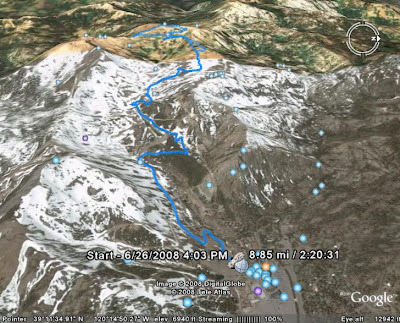 Our starting elevation was just over 6200 feet and the elevation after the run up was just shy of 8800 feet. To hit the top, Jamie and I set out at a pretty decent pass which slowed to a walk after about 100 yards. The combination of the elevation and smoke zapped us. The rest of the run was done at a very controlled and even run/walk pace. The run up was great and lots of fun and I must say Danny had the best run of us all when considering his training has been pretty nil due to knee and foot problems. Once hitting the top we skirted the ridge for some hiking fun before starting back down. On the way down I couldn't pass up a dip in a water collecting basing from some drain pipes. While it felt really good, I did pick up some "mountain crabs", but it was well worth it. The descent was much quicker than the ascent and we quickly changed and hit dinner in the village. We were starving as we had skipped lunch and in dire need of adult beverages. Despite the sad news of the cancellation and the smoke that was quickly enveloping Squaw, we had a great time at dinner with excellent food and company. All's well that ends well. Also of significance on this day I became an Uncle for the second time. My little brother Jason and his girlfriend Brandi gave the world my nephew, Hutton Matthew. The kid was 8 lbs, 12 ozs upon entering the world, so big kudos to Brandi for bearing this child. Congratulations to Jason and Brandi, and to me! After our trip to Squaw, Danny and I were faced with the question of what next. It is a curious thing to be on vacation, and for me the first time I have been away from my family on a pleasure trip since the Riley's birth, and not know what to do. So we headed south towards Danny's home turf of San Jose with plans land in Big Sur for some camping. Mother nature had other plans. After spending a night in some anonymous place, we reached Danny's apartment early the next morning to retool our stores and plan the rest of the trip. The first thing we did was check on campgrounds in Big Sur. We were lucky to have done this because we learned that there was a voluntary evacuation of Big Sur in place due to the wildfires. Instead we headed down to Monterey and its most excellent aquarium. In the evening we headed over to surf town Santa Cruz for some dinner and to hopefully find a campsite. Unfortunately there were no campsites to be found anywhere, so after some dinner and people watching, we headed back to San Jose for a night of rest at Danny's. Saturday morning we headed to Big Basin Redwoods State Park. The goal was once again to find a campsite, but we had no luck. The air around the Santa Cruz Mountains was relatively clear of smoke so it seemed that all of Northern California's campers had moved to this area and filled every available campsite around. 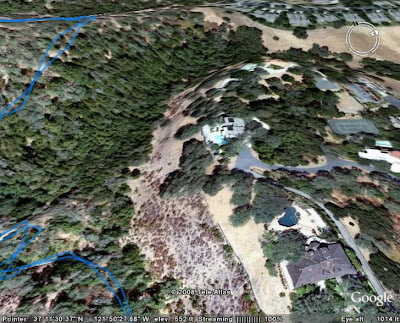 Danny and I had originally set out to hike through the majestic coastal redwoods, but after driving in and seeing the beautiful forest, I started daydreaming about a run through the trees and set about talking Danny into running the trails. This wasn't difficult as he quickly agreed and we set out on the longest trail. Our run through the park took us 11.6 miles in just under 3 hours. This time included many stops for photos of the cool water falls we ran by and the unbelievable trees. There was also a bit of climbing during this run, as we climbed over 2300 feet. The best part of this trip though had to be the cookout we had at the conclusion. Danny had been kind enough to grab some beautiful steaks for us to grill at our first campsite, but as this campsite never materialized we ended up toting the steaks all around Northern California for few days before deciding they had traveled enough and we plopped down on a picnic table and cooked them right then and there. I also learned that squirrels eat more than nuts. As we were waiting for our steaks we started munching on beef jerky (a must for every backpack). A curious squirrel was milling about so I threw him a piece of jerky (sorry, I know one shouldn't feed the wildlife but I couldn't resist) and he woofed it down. So I proved that squirrels are carnivores, or I had just created the first of a new species. Watch out humans; squirrels will now be coming for more than just your bird seed! After the day at Big Basin, the trip became a little more domesticated. We headed back to San Jose to Danny's apartment (after stopping for some gelato in Los Gatos, a neat little town) and were lucky enough to meet up with Danny's roommates. We had a great dinner with them and then hung out and chatted. The next day we attended Danny's church, and then headed over to the Santa Cruz mountains for some winery hopping, watched opera in the park in Los Gatos (a friend of Danny's was singing), and then went to see "The Happening". What a waste of money. Do not waste your time. I think M. Night Shyamalan committed career suicide with this one. Forced dialogue, many awkward moments, and completely predictable story all contribute to a terrible experience. On Monday we went on a tour of the Winchester Mystery House in San Jose. While this is no doubt a tourist attraction and somewhat kitschy, it is still a site worth seeing. I saw a documentary on the place some years ago and when Danny asked if I wanted to see it, I was game. The house was built over a period of 38 years by Sarah Winchester, the heiress of the Winchester Rifle fortune. She lost her husband and daughter early in her life. After consulting with an occultist, she bought a house and started building on to it for the rest of her life. This was because she was told and believed that this was the only way to keep the spirits of those whose lost life to the Winchester rifle at bay. So she built, and built, and built...stairs to the ceiling, doors on the second floor that open to the outdoors, and all kinds of thing that have the number 13 associated with them (windows with 13 panes, closets with 13 hooks, chandeliers with 13 candles, etc.). Crazy chick. But she built an interesting house. After this tour we ate some more Mexican (fish tacos again - yummy) and set off for one last run before I headed back home. So Danny picked a local county park with some trails and we did some running. The local county park that Danny chose was a gem. The Almaden Quicksilver County Park in Santa Clara County is an unbelievable place. Almost 35 miles of trails, complete with quicksilver mines and tons of wildlife, are available for runners, horses, and bikers. It is also the home of the Quicksilver Running Club of San Jose, and their two races including the Quicksilver 50 Mile, 50K and 25K races in early May and a series of shorter races in October (Danny, if I lived out there I would sign up with these guys). Also of note is that they run an aid station at Western States. Good on to them! Our run was amazing. 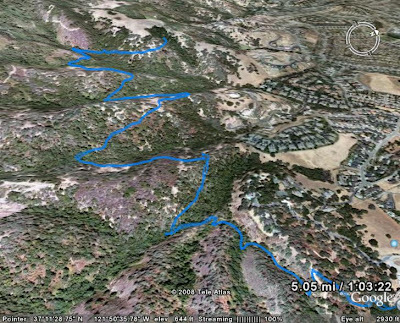 We made our way around the trails (periodically tasting our fish tacos and beer), dropping into little canyons along the way as we skirted a ridge ascending and descending many saddles (the satellite photo of the course shows this pretty well). We spotted quite a few black-tailed deer (fir st for me), one of which sported a 6-point rack. Our goal was to do a nice loop which would take us by a still open quicksilver mine tunnel, but we failed to spot the turn and after about 35 minutes of running, we decided to turn back for the parking lot (on the way back it was hard to not turn off the course and cross the canyon to jump in the pools that we could see from the trail - see the detailed photo). We finished our run around 5 PM, and quickly headed home to allow me to clean up for my red eye that left a few hours later. So ended my trip. While Danny and I were continuously faced with changing conditions courtesy of mother nature, we always kept our sense of humor and laughed off our relative poor luck. All in all, it didn't matter what we were doing. I have known Danny now for more than half my life. He is in the truest sense of the term my best friend. With the absence of all the epic events we had planned (WS 100, Yosemite, Big Sur), it left us with more time to simply relax and catch up. I got to join Danny at his church for a Sunday service. I greatly admire Danny's faith and his commitment to his religion and his community. I only wish I had an ounce of the faith Danny lives out every day. Much like the many excuses people garner to justify not running or not being fit, I carry with me excuses for my weak display of faith. I have so many excuses for not taking time on Sunday's to go to church (namely my long runs). This is something I have to work on, if for only to give the option of exploring faith themselves. Anyhow, I hope everyone out there has a friend as great as Danny. He has a way of handling my moods and eccentricities with grace and like an old pro (he's been doing it for half his life). I can honestly say that this extra time Danny and I got to hang out left me with very little regret for having missed the Western States race and all our other original plans. Also of note, Danny stepped his running up in a big way and was with me on every run we did, despite a foot injury and a lack of run training. Never once did he grumble, not even when I suggested we run Big Basin Redwood SP as he was getting all geared up to hike it. What a guy and what a friend. Finally, boy did I miss my two little ones, Riley and Quinn. I really never expected to miss them as much as I did. I couldn't help but feeling like I was missing something the entire trip. I was nostalgic many times as I watched parents playing with their kids or cleaning up messes in restaurants as their food grew cold. I am a lucky guy to have a family that is super supportive of all my running. If they didn't travel with me to all my races, I might have quit racing a long time ago. Now I am one week away from my second Vermont 100, my cold is gone, I have just about cleared my lungs of the smoke residue from the trip, and I had Quinn's stomach virus. There is nothing that should get in my way now. Wish me luck. To view other photos of my trip, check out my Picasa web album.